COLUMBIA, S.C. — The NCAA was billing the battle between top-seeded Duke and No. 9 Central Florida as Golaith versus Golaith on Twitter before Sunday evening’s marquee matchup with 16,332 fans watching at the Colonial Life Arena. 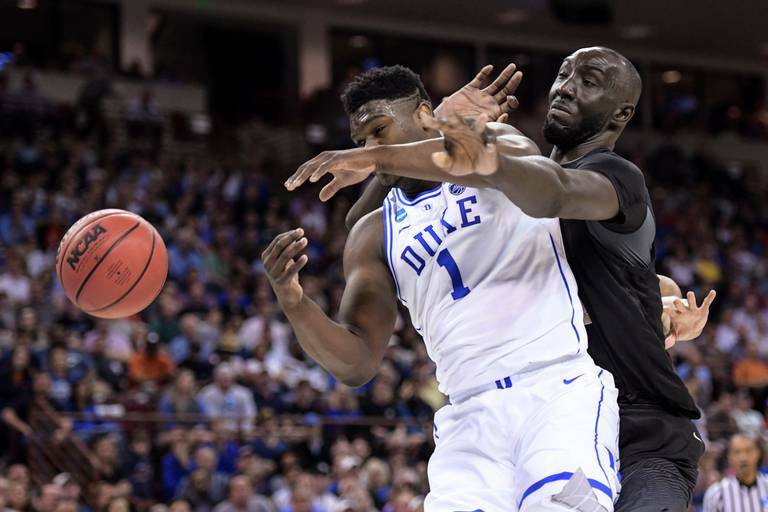 It turned out to be more like Godzilla against Megagodzilla — 7-foot-6 senior Tacko Fall going at athletic freshman phenom Zion Williamson — as the Blue Devils survived two tantalizing UCF shots at the end for their incredible 77-76 victory in one of the most memorable second-round contests in tournament history. With Duke trailing 76-73, Williamson earned a questionable call to foul Fall out of the game with 14 seconds left on his driving lay-in to cut the Knights’ lead to one point. Williamson initiated contact of the play as Fall faded slightly away from the young superstar and many watching expected Williamson to be called for a charge. Williamson was short on his ensuing free throw, but RJ Barrett (16 points, eight rebounds) hit the offensive boards and his put-back at the 12-second mark gave the Blue Devils it decisive advantage. Duke dodged two narrow misses in the last three seconds on B.J. Taylor’s drive and Aubrey Dawkins’ tip to avoid tournament elimination. Both UCF attempts seemed to hang in a time warp around the rim before falling off. While Williamson and Fall might have drawn the top, pre-game billing, it was junior guard Aubrey Dawkins who stole the show for much of the evening with 32 points on 12-of-18 shooting, four assists and three steals. Dawkins finished just one missed shot from writing some incredible tourney history. Even with that painful miss, Aubrey Dawkins earned tremendous respect. Williamson scored a team-high 32 points with 11 rebounds on 12-of-24 shooting, never leaving the floor during the 40 minutes of game action. But he missed a tentative trey with 30 seconds left that imperiled the Blue Devils. Williamson got his second chance when Javin DeLaurier came up with an offensive rebound. UCF took its largest second-half lead, 74-70 with 2:08 left, when Fall (15 points, six rebounds and three blocked shots) slammed home a rebound for his fourth and final dunk after the Knights ran out the 30-second shot clock and the buzzer sounded. Fall kept playing and the officials made a lengthy video review at the conclusion of the play. All three officials viewed the play multiple times before agreeing the previous shot had narrowly grazed the rim. It was this Senegal native’s final decisive moment on a night where foul trouble limited him to 25 minutes. Williamson had nothing but praise for his larger-than-life opponent. The game played like a grand master and his protege matching moves on the chess board in the first half as Johnny Dawkins unleashed his dynamic pair of son Aubrey Dawkins and center Fall, while Coach K countered with adjustments to disrupt the Knights’ free-flowing offense and to juice up the Blue Devil transition game with the Blue Devil attack stagnating. With the younger Dawkins hitting 6-of-8 shots, including 3-of-4 from three-point range for 18 first-half points, UCF soared to a six-point lead in the initial six minutes. Fall picked up two fouls in the first 10 minutes, but stayed in there long enough to tally seven points, a trio of dunks, three rebounds and a block in eight-and-a-half minutes on the court. But his absence allowed Williamson to break loose for 15 points. With the Duke fast break running more efficiently as the half moved along, two other freshmen, Barrett and Cam Reddish combined for 21 more points as the Blue Devils rallied for their 44-36 halftime edge. Reddish finished with 13 points and drilled 3-of-4 three-pointers, including a crucial one with 1:43 on the clock that set the stage for the late heroics. Everyone of those points proved crucial in Duke’s tight win. Johnny Dawkins tried to find perspective as he dealt with the devastation of the narrow loss, but relished the effort his Knights displayed on this special evening.